Not So Perfect Karthi: Bengaluru Hogi! Wheeze, wheeze, air-conditioners and I really do not mix. Fortunately, this time my preventive measures worked somewhat well on the journey (Vitamin C, warm head covers), so I have escaped with minimal damage. This time we took a long-weekend trip to Bengaluru. If it had been left to us, we would have spent all the time visiting our various friends and relatives. But there are the little people to consider. They want excitement. They want fun. They want time to play and jump around. They want NEW experiences. 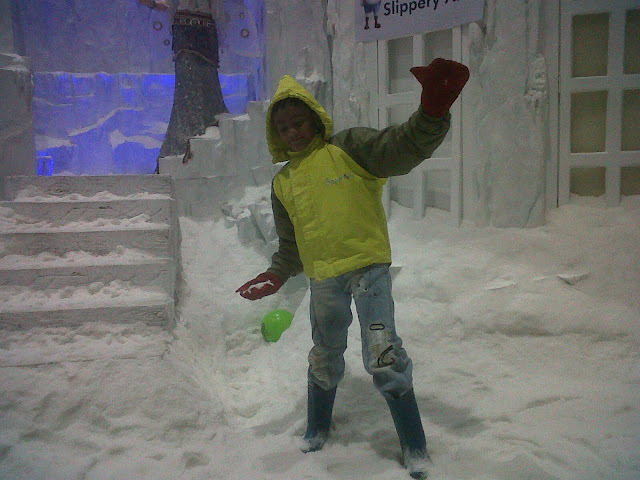 Our first kiddie stop was Snow City in the Palace Grounds. Anikkuttan, our younger one was the most vociferous in the demand for this. He's always been asking us to "get on a plane and go somewhere with snow". 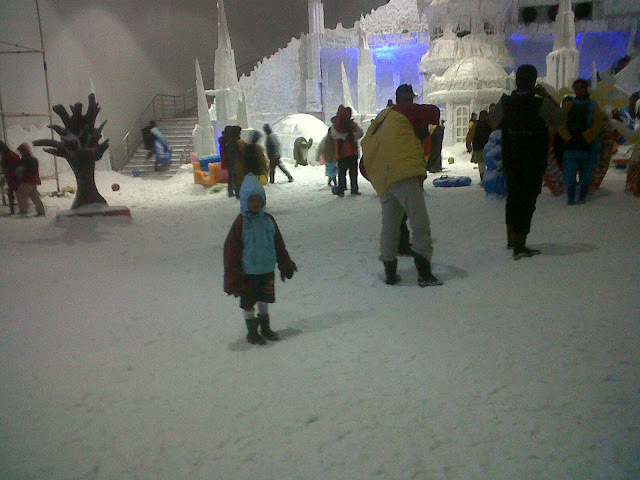 At Snow City, DH and the kiddos waited for almost an hour to gain entry into the 1 p.m. slot for some snow fun. They were provided with a protective jacket, gloves, ear muffs and snow boots. They also waited in a somewhat cold chamber to acclimatize themselves before being exposed to the -5 degree Celsius of the snow room. For the first few minutes everything was hunky dory as they rolled snow balls and pelted each other and posed for pictures taken by their doting Dad. But soon enough, a few snowballs found their way into the boots and poor Ani's feet were chilled to the bone. Ten minutes into the much-awaited snow experience, Ani was out for the count and DH had to follow leaving the hardier Kunjunni to enjoy himself to the max on all the rides. He didn't come out till HIS 45 minutes were up. The very picture of true enjoyment and intrepidity! The entry ticket includes an audio-tour! We get a handheld device and headphones which explain the exhibits to us. 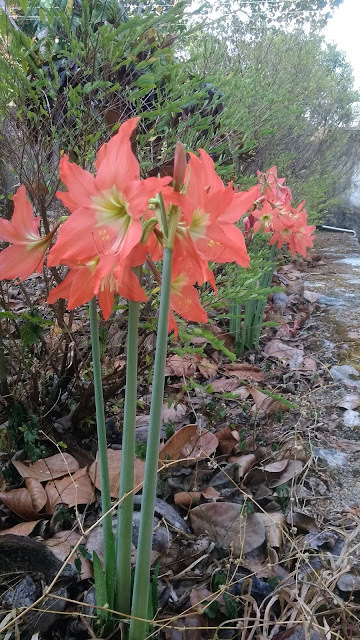 First time I've seen anything of the kind in India. The tour is even available in Malayalam! Note: Please carry a photo-id with you because that needs to be given as security for the audio device. As for the tour - see all those interesting turrets and round rooms? There was no access to them or the balcony. Inside, the architecture and decor is a mishmash of Tudor, Victorian and Art Deco styles with a generous sprinkle of Indian all over. The general effect is not bad, though. There were beautiful stenciling patterns, absolutely gorgeous floor tile patterns and a few unique pieces like the weighing machine for the royal jockey. To add to the fun, we had a celebrity sighting. We spotted actor Venkatesh in action for a Telugu movie! All in all, good for an outing if you have time to kill when the rest of the family are having fun at Snow City. Can't guarantee the celebrity sighting, though!!! Next we took the kids to that school-tour staple - the Vishveswarayya Science and Technology museum. Well, it has changed a bit from what I remember of seeing 25 years ago. There is a life-size exhibit of the Wright brothers' first aircraft that greets you right in the main hall. The story of the creation of the replica to mark the centenary of the invention also gets pride of place alongside the exhibit. There is also an animatronic dinosaur that scared all the little kids who went in. Well, the rolling eyes which swiveled to nail one were a bit too much for me too, I must confess! And I had to carry my almost-five-year-old to "make friends with the TOY dinosaur", swiveling eye or not. That's a huge perk of being a parent, one can hang on for dear life to another morsel of humanity and pretend you are doing it to give THEM courage! Planes and dinosaurs aside, the kids including our 6-ft one were entranced by the science toy store in the museum and spent almost an hour picking and choosing what to take home, worse than any group of women in a bag shop. And as for the adults: all we had was a very rushed one hour at Commercial Street, almost half of which went in walking to and from the parking area! Life is so unfair!!! Having traveled in most of the southern and eastern portions of the fast-expanding city, one could not but marvel at the change and feel nostalgic about the old Bangalore. So many of the main roads of the old, elegant residential areas are now full of plate-glass showrooms of international brands. KFC which had just one outlet on Brigade Road back in 2001 now has so many outlets that it is like a rash that has spread over the city. "Development" is going on at such a fast pace that infrastructure is not even in the previous chapter, let alone on the same page. We went to a luxury apartment complex situated on the shores of a lake, only it was literally in the middle of nowhere - there was only a dust track of the kind seldom seen even in my road-wise backward home state! The state of our backs after we bumped our way to the apartment and were hopelessly lost on our way back, was pathetic. I thought that the old Bangalore was only a thing of fond memory until we were on our train back from the City Railway station. The train passed through some old neighborhoods and the Cantonment area and I heaved a sigh of relief. At least a part of old Bangalore was left unmolested. Thank God for small mercies!